Last night, I received a phone call from fellow Speedhunter Calvin Wan, who apparently was in town to drop off his FD3S RX7 to be transported to the Formula D event in Panama. He asked me if I would go to Garage Boso with him, where he needed to unload his SUV-full of CE28 wheels and Falken tires (seriously, it was packed to the roof! Wheels and tires and Apex exhaust on top of the clean leather interior…) to mount and balance them. 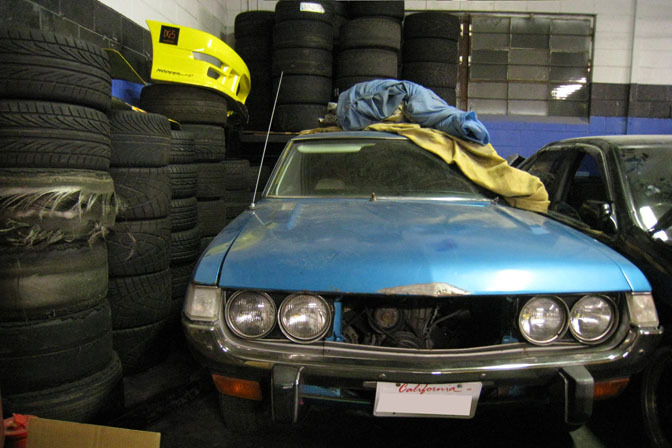 While we were at Garage Boso snooping around and talking with the shop co-owner, Frank Siharath, I was told there was a car in the corner that I might be interested in. Frank pointed out this 1973 Toyota Celica RA21. 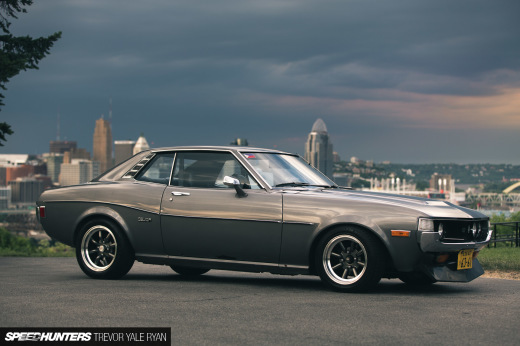 Apparently, Video Option founder Daijiro Inada found this Celica for sale in the USA and asked the talented owners for Garage Boso, Frank and Ross, to build it up for him. looks like an SR20 is already in it. Would you guys please make a desktop for this? That would be awesome. Love the site! Crazy! Brian, you know what's up! Good eye, I agree. I also agree, I don't like those new wheels on old cars. GODAMNED GOOD EYE BRIAN W!!! he is correct. Not to sound like a purist or anything, but I have to agree with Antonio on this one. Yea, not a fan of foreign engines in Toyota's. I can understand why people put awesome 1/2JZ engines in whatever though. I think if someone just HAD to put a newer engine in a classic Celica... how about a 2ZZGE from a ZZT231 FWD Celica? That thing will be almost like putting an S2000 engine in the car, since the Celica is so light. 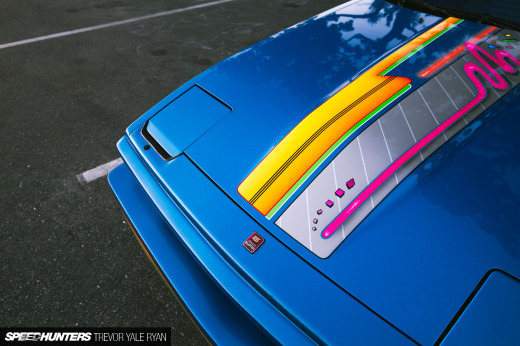 Plus, it comes from a CELICA! Oh what a feeling... TOYOTA. that 2zz comes in a matrix too, hahahha. just thought i'd point that out bro! 18RGs are an ideal swap, which are 2.0L DOHC 8 valve Yamaha Hemi head, but Toyota stopped making parts for it. If you want a newer engine with lots of parts, then specs close to the 18RG would be nice. A popular swap in NorCal is F20C. A few guys run SR20DET. If Im not mistaken, a Celica LB w SR20DET competed in D1 last year. Keeping it Toyota you could use 4AG, 20 valve 4AG or BEAMS 3SG. I prefer a period correct engine, but its tough when you cant get OEM parts. Keep it old school! More RA's please.. swapped or not. Something about those cars... they just need carbs. A carb'd 4age would be a really nice swap. It'd be kind of like putting a period race motor in except that you'd have a (semi) relable motor that runs on 91oct. Or just build the 20R (?) that's in there for a car with some real cred. EXACTLY!!!!!!!! Thank you for posting that up Zulu! Great information. You obviously know your stuff! Hey if you know anyone interested, I have a complete 2TG Yamaha engine for sale... it's not assembled, but it has everything. Ported/polished head, normal cams, camgears, block, pistons, etc. I have a TRD clutch for it and a bunch of other parts too. Actually I should dig my engine crates out of storage and take pics of it, I've been keeping it for spares for almost 10 years but never put it together because my early 2TG with TRD internals is still strong. I really like the big growl of twin carbs, with the rattle of a built engine shaking an old Toyota. Man just thinking about it makes me miss driving my mango. I wish the rain would stop already so I could take it out for a midnight drive! Props to people who put in time and effort to find the rare engine parts. 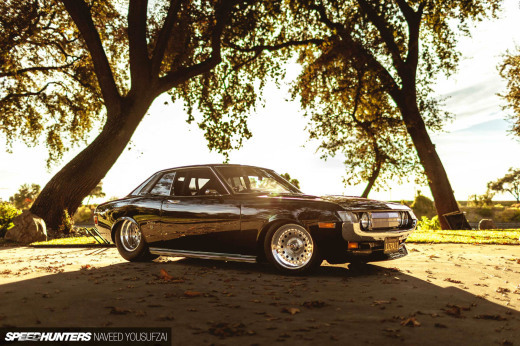 Putting an American V8 in a rare classic Toyota is blasphemy. 350s are great, but keep them in the Camaros. I say, keep it TOYOTA. Used to have a '77 RA28 myself. Wish I had a place to store that rusted old Celica, and maybe fix it up some day insted of getting rid of it. thanx for the compliments antonio! coming from you i means alot man. You can post the engine up on a celica forum i go to alot 1stgencelica.com i bet alots people would be interested in it. also maybe toyota3tc.com theres a bunch of T series guys over there mostly corollas though. yeah nothing feels like a carb oldskool toyota engine uner the hood of your car. if i had the cash id take you up on the offer of that 2tg. it sounds like a great engine! I took my celica out for a nice freeway drive today. I was crusing at 70mph in 5th gear no problems at all. i even saw a 510 with a roll cage while cruising. we looked over at each other and gave each other a thumbs up. yeah man once the weather in socal is sunny you should take the mango out. I'd put an LS1 in anything! never let me down. But for my RA21 Celica, I choose 20valve 4AG.